Leicester City Football Club has appointed McLaren Construction as the principal contractor to build its new state-of-the-art training centre at the former Park Hill Golf and Fishing Centre at Charnwood. 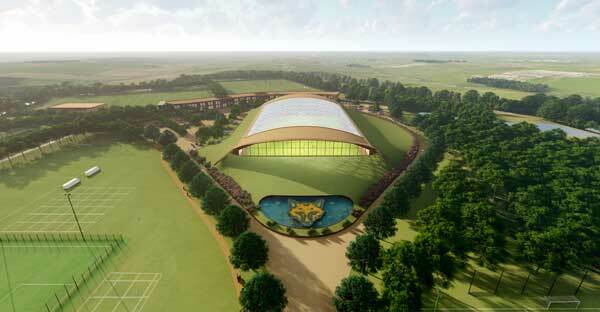 Blending into the landscape, the main building will be partially underground and surrounded by 11 full-size outdoor pitches, eight smaller pitches, five training grids and two goalkeeping areas. The centre’s main buildings will be steel-framed structures and BHC will be fabricating, supplying and erecting the project’s steelwork. The project supports biodiversity in the area, with the creation of 17 new ponds over 9,400m², to attract wildlife and help to manage surface water drainage. In addition, 38,000 new trees will be planted across more than 11 hectares of retained woodland, alongside 4.4 hectares of new planting and landscaping and 14.6 hectares of wildflower grassland. The centre is set to complete in mid-2020.